For aficionados, sipping a fine tequila is an elevated experience, worlds away from the shot-lime-salt ritual that has been the bane of many an undergrad’s night (and morning). 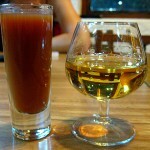 Sangrita (“little blood”) is a traditional Jaliscan accompaniment to tequila, meant to complement the crisp, peppery spirit and cleanse the palate between sips. 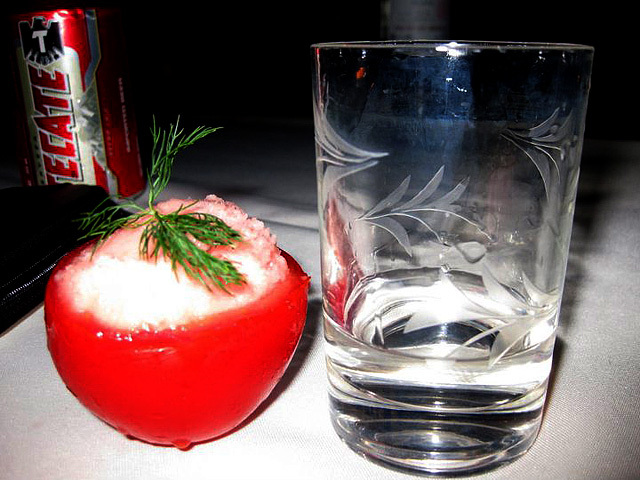 Though its variations are many, sangrita is typically made with tomato juice, orange juice, lime juice, and a spicy element (e.g. hot sauce or chilis, fresh or dried). To generate awareness and expand the possibilities of this spirited ritual, Tequila Ocho and The Bon Vivants (Josh Harris, Scott Baird and L.A. Ambassador Alex Straus) teamed up to launch ¡Viva Sangrita!, a nationwide competition that challenged bartenders to create original sangritas to pair with one of the three current Tequila Ocho releases: the 2009 Las Pomez Plata, 2009 Las Pomez Reposado or the 2010 San Augustin Añejo. Innovation was encouraged, and other than the flavor profiles of tart, sweet, spicy and savory, there were no restrictions on the sangrita creative process. Recipes from around the country were submitted in April, and now The Bon Vivants are hitting the road to judge a series of events taking place in cities representing five regions: San Francisco, Miami, New York, Austin and Los Angeles. Entries weren’t limited to residents of the host cities; Texas has an entry from Milwaukee, while sangritas from Boston and Washington D.C. will be competing in New York. One winner will be selected per region to compete in the ¡Viva Sangrita! National Finals, taking place in New Orleans in July. The National Champion will win a trip to visit the Tequila Ocho distillery in the highlands of Jalisco and “experience all this amazing spirit has to offer, in the place of its birth.” Last week, Morgan Schick (Nopa) was chosen to represent San Francisco at the National Finals. Schick’s winning Sangrita Sorbet is paired with the 2009 Las Pomez Plata. The Los Angeles semi-final event will take place on Wednesday, June 15th at The Edison. The contestants will take over the main horseshoe bar and guests can sample the sangritas paired with Tequila Ocho. Passed apps and music will add to the festivities. Guests will have something more to do than sip tequila and sangritas: The Bon Vivants are inviting everyone at the event to vote for their favorite sangrita. The popular vote will be factored in with the judges’ scores to determine the winner. So there’s a possibility that the judges will choose one sangrita, but the crowd influences the final outcome by throwing its weight behind a different entry. I spoke with Harris before he, Baird and Straus embarked on their ¡Viva Sangrita! tour. While all the sangrita entries are impressive, Harris thought that L.A. and S.F. in particular “came on really strong.” Harris hopes the tasting events will appeal to everyone and not just the cocktail geeks. No problem there: ¡Viva Sangrita! at The Edison promises to be a fun, educational and interactive night of excellent tequila and delicious sangritas created by some of the city’s best bartenders. ¡VIVA SANGRITA! ¡VIVA TEQUILA OCHO! 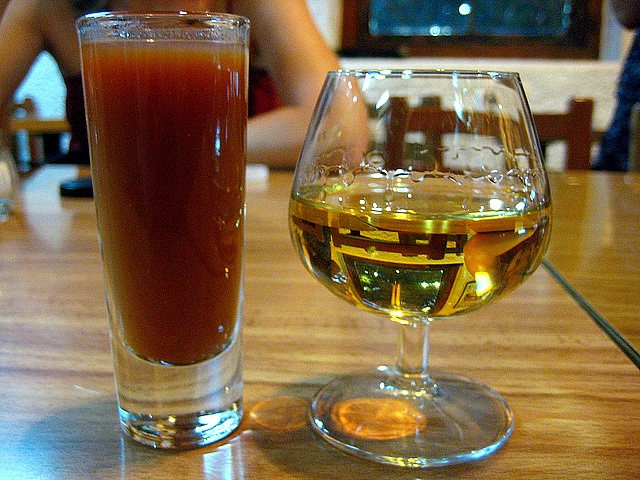 “Tequila y Sangrita” photo by kara_vanmalssen, used with permission through CC BY-NC 2.0.